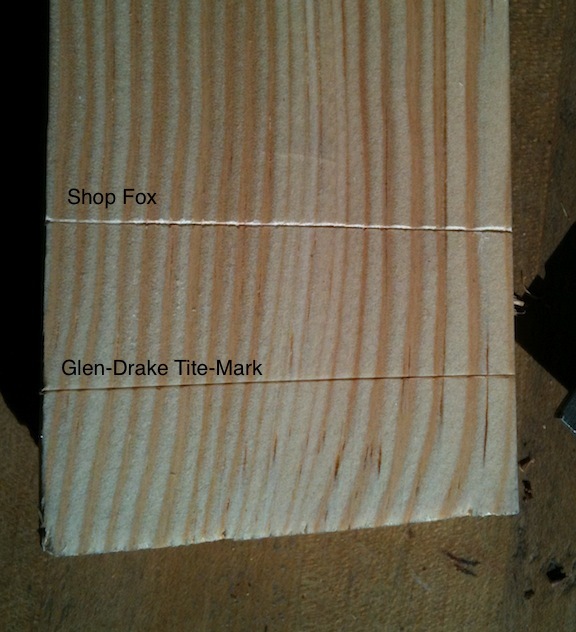 Early on I blogged about my less than satisfactory experience with the Shop Fox marking gauge. It was only $14 or so, but even after lapping the dull cutter it still didn’t make a satisfactory line. So I decided to reward myself recently with a Tite-Mark. I’m not sure what I was rewarding myself for. Certainly not for being a good boy. Maybe for putting up with the Shop Fox gauge? Unpacking the gauge I was surprised to find a DVD packaged with my order. The DVD is a video catalog of sorts, and is a nice touch. It also explains how to use the gauge and what the optional accessories offer. The gauge is every bit as nice as I expected. It’s beautifully made. The micro-adjuster is very handy. It’s made by real people, in this country, which I really appreciate. But here is the money shot: it makes crisp lines on wood. I mean, that’s what a marking gauge is supposed to do, and it’s what kills the Shop Fox gauge at the starting gate. Notice how, even after I sharpened the Shop Fox cutter to a razor edge it makes a very wide mark and even rides up over the growth rings. Every stroke with the Shop Fox makes the line wider in addition to deeper. Not Good. The Glen-Drake makes a clean cut through the fibers. Subsequent cuts just deepen the mark, then don’t make it any wider. 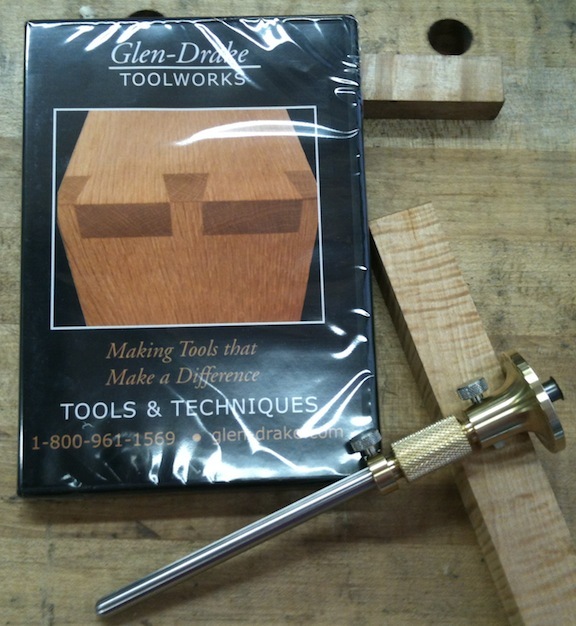 Yes the Glen-Drake marking gauge is 4 or 5 times the cost of the Shop Fox, but that’s the wrong way of looking at it in my opinion. How much is the wood going to cost for you next furniture project? Think about the waste from a few sloppy tenons or dovetails. Think too about people in this country creating something with their hands instead of shipping the work offshore so they could maximize their profits.